The 13 November 2015 Paris attack materialized recent messaging by violent extremist groups such as the Islamic State of Iraq and the Levant (ISIL) and al-Qa’ida in the Arabian Peninsula (AQAP) that emphasizes attacks against targets of opportunity. ISIL propaganda openly encourages sympathizers to strike wherever possible with whatever means the attacker has available to him or her. Entertainment venues, bars, and restaurants can be found everywhere in the US and are publicly accessible or lightly defended, making them a logical choice for a would-be attacker inspired by this type of propaganda. 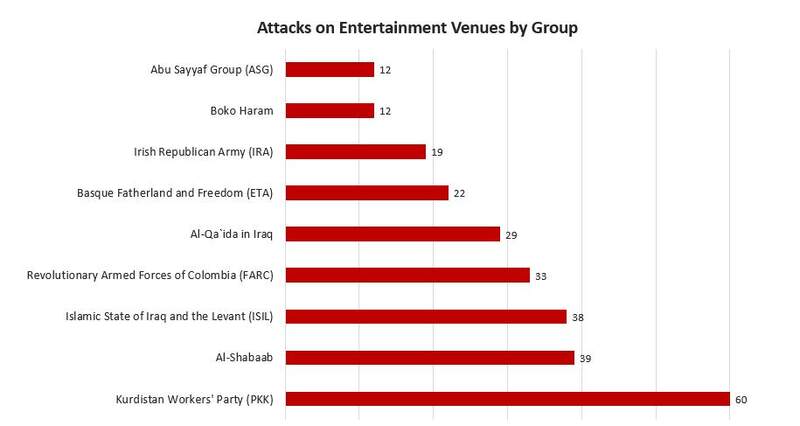 Though most attacks against entertainment venues during the time period studied in this analysis (1990-2014) were committed by violent Islamist groups such as al-Qa’ida and its affiliates, it should be noted that extremist groups and individuals motivated by a number of distinct ideologies have also selected entertainment venues as targets. Irish Republican Army (IRA) attacks in the UK and the American anti-abortion extremist group Army of God illustrate the different motivations of terrorist groups that have chosen to target bars, restaurants, and other lightly secured places where people gather. Though North America and Western Europe have seen lower numbers of entertainment venue attacks in recent years, there is concern several factors may increase the vulnerability of these locations. 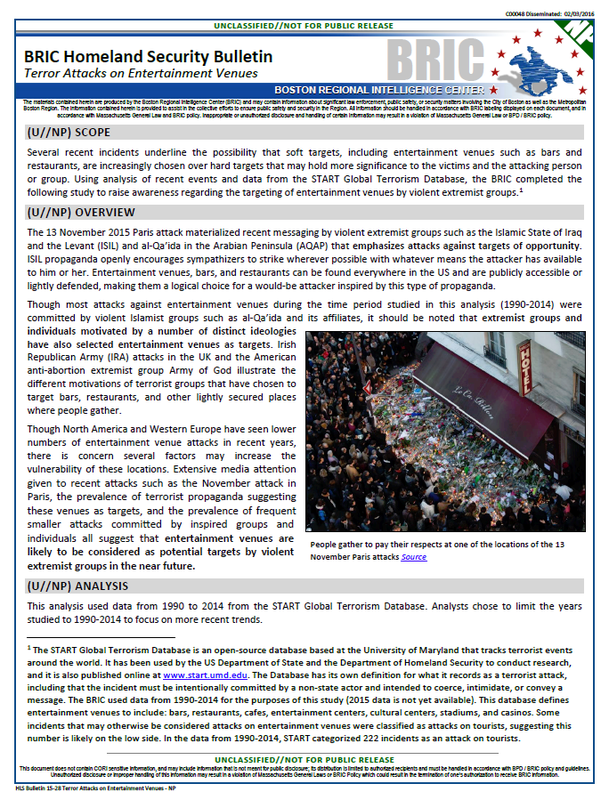 Extensive media attention given to recent attacks such as the November attack in Paris, the prevalence of terrorist propaganda suggesting these venues as targets, and the prevalence of frequent smaller attacks committed by inspired groups and individuals all suggest that entertainment venues are likely to be considered as potential targets by violent extremist groups in the near future. This analysis used data from 1990 to 2014 from the START Global Terrorism Database. Analysts chose to limit the years studied to 1990-2014 to focus on more recent trends. From 1990-2014, the Database recorded 100,964 total terror attacks throughout the world. Of those attacks, 1,510 were on entertainment venues.